I made a resolution to post at least twice a week, but this resolution was crushed instantly when F woke up with a temperature of 40°C (104°F) a while ago. And then some random virus infection knocked her out for two weeks. At first she was fine. She’s always been one of those kids who don’t mind fever. She did enjoy being at home and we spent a lot of our time together cooking. But then one day I asked her if she wanted pancakes and if she’d like to prepare them. She didn’t. Instead her energy levels dropped and she needed a lot of rest. She spent over a week sleeping a lot and all she was eating were three spoonfuls of yoghurt per day. It’s interesting how different we react to illness. When I get sick I try to ignore it, grab a pain killer and some tissues and do business as usual. I want to function alright. Sometimes it works, but a sinus infection or the flu will force me to bed just like anybody else. F intuitively did the right thing. She slept a lot and refused to eat. That last part drove me crazy because she’s usually a pretty decent eater. She got checked up at the doctor’s office a couple of times and the virus was accompanied by a bronchitis. I am not very good at being patient and I was dreaming of a shot or some super pill that would make my kid act normal again. I hated sitting at home and I wanted to go back to our regular schedule. Of course a couple of days later my vegan superpowers (just kidding) left me and I got the same bug. At least we were sharing our misery now. I think I learned a lot during these two weeks. Not for the first time I had another lesson in parents don’t know best. Since a fever usually never lasts longer than 3-5 days with F I was pretty sure that she had to be seriously ill. I rolled my eyes when the doctor told my husband that all we could do was wait. They see these infections every day and even a hacking pertussis imitation cough won’t make them blink. I couldn’t stand F refusing to eat day in day out. I didn’t really trust her body. But my child is tough and she knows what is best for her. Eventually the fever went away and she was feeling better. I realised this when I opened a cookbook at the table and she pointed out some brownies. She told me we had to make them. The next day we sent her back to kindergarten where she ate two servings of pasta for lunch. And when she came home, she ate two large squares of the brownies I had made for her. She was back to her old self. A while ago we also made some white chocolate and lemon tartelettes together. Yes, the ones I told you about. But while we were stuck in our flat trying to beat that bug, you probably ate all of that chocolate spread I told you not to eat. Well, that’s okay. I don’t blame you. Because while we made these tartelettes we had a similar problem. F asked me about a hundred times: “Can I eat some now?” Because we have a lot on common: We are very impatient and we like to eat dessert. 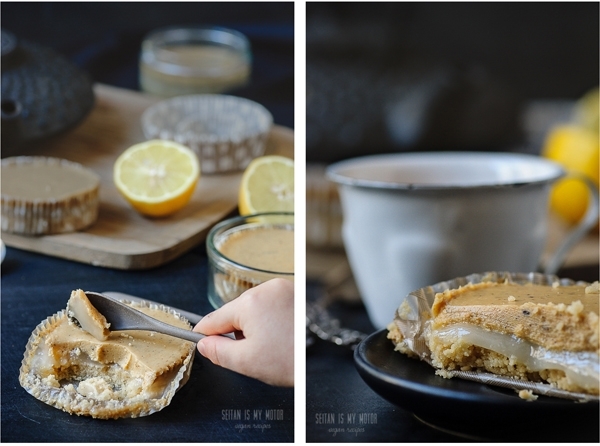 For these vegan white chocolate and lemon tartelettes you won't need an oven. All you need is a little patience to let them set in the fridge. Have 6 ramekins ready, about 9 cm in diameter. To make the crust, combine crackers or cookies and oil in a food processor. Divide between the ramekins and press firmly into the bottom. 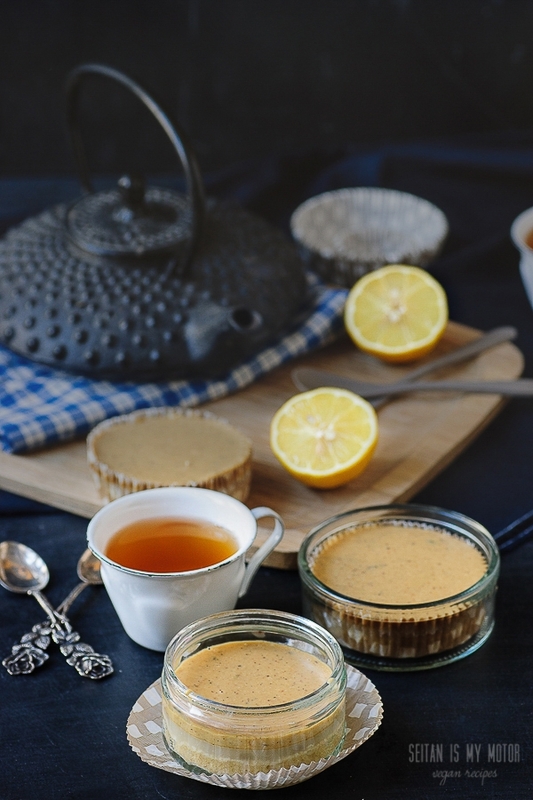 To make the filling, combine lemon juice, water, 4 tablespoons of oat cream and agar agar in a small saucepan. Combine the remaining 2 tablespoons of cream with the cornstarch and stir until dissolved. Bring the lemon mixture to a boil and cook for 1 minute. Add starch mixture and cook for another minute. To make the topping, place the spread in a small heat resistant bowl and melt over a water bath. Pour over the filling and place the ramekins in the fridge, until the tartelettes have set. Remove from fridge about 1 hour before serving. Oh, I’m sorry to hear you guys have been unwell – that sounds awful, but glad you are both feeling better. These tarts look beautiful! Those Tartelettes look so delicious! There’s nothing as scary as seeing your kids really sick. Poor little F — I’m glad she’s finally feeling better. I can understand the restorative value of brownies and lemon tartelettes! She knows what’s best. 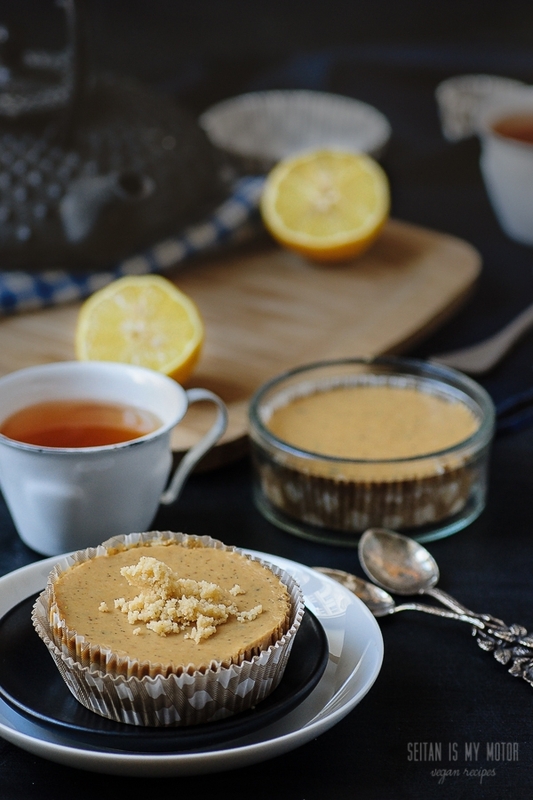 In England we have a saying “Feed a cold and starve a fever” obviously F know’s what’s good for her…including white chocolate lemon tartelettes as part of her recuperative regime! There’s a lot of interesting research going on right now about fasting to cure all sorts of things, I have to say when I’m ill it’s about the only time I don’t want to eat. Must be something in it!